Want to get "high"? Dare to take on the Vertical Net Crossing? What about the Burma Bridge? Think no further and join us for an action packed experience on our amazing High Ropes Challenge Course, with 6 exciting obstacles! 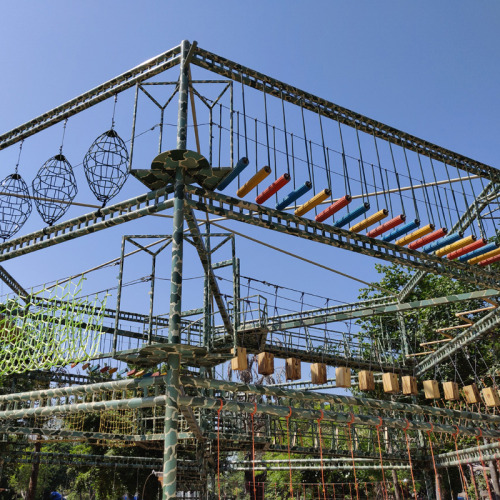 Take on each challenge head on tackling Burma Loop, Horizontal Net, Burma Bridge, Swinging Bridge, Vertical Net Crossing and Wooden Obstacles, with friends, family, colleagues or just by yourself! Experience a unique combination of adventure, team building, and personal achievement; and built for endurance and problem solving skills. You can be assured of safety of the highest standards of quality and not to forget: a FULLY action-packed experience.